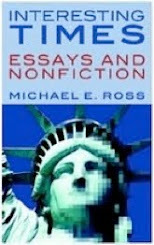 UNLESS YOU’VE been vacationing under a rock on the floor of the Marianas Trench, you certainly know about the deeply passionate, teeth-grinding rage now endured by the Tea Party movement, in the wake of the latest in a series of embarrassing defeats, one of which recalibrates the received wisdom about race and Republican politics. Conservatives haven’t been this upset in weeks. The Tea Party’s candidate in Mississippi for the U.S. Senate, state Sen. Chris McDaniel, 42, got schooled on Tuesday by the incumbent, Sen. Thad Cochran, 76, a Republican senator for 35 years; a man with the closest thing to a courtly demeanor the Republicans have had for a long time; a Mississippian who was first elected senator when McDaniel was all of seven venerable years old. Tea Party defeat was contagious on Tuesday. In Oklahoma, Rep. James Lankford handily defeated former state House Speaker T.W. Shannon in the GOP Senate primary. Shannon, who is Native American and African-American, had the support of Tea Party darlings Sen. Ted Cruz of Texas, and former Alaska governor and political personality Sarah Palin®, in the race to succeed the retiring Tom Coburn. Besides the obvious generational derision McDaniel may be privately enduring — hot damn, Chris, you let that old man beat you? What’s the world coming to? — he and the Tea Partiers are also forced to confront a fallacy in their fundamental distrust in congressional longevity: Since no one gets to be a senator for a single 35-year stretch, what happened in Mississippi on Tuesday was, at the end of the day, Mississippi’s latest vote of confidence in Thad Cochran. For all the attention on Cochran’s narrow but deafening victory over McDaniel last night (by 2 points, a margin too thin for a sheet of paper to get through), despite the concerns about Cochran’s age and controversy over his campaign tactics and some intemperate statements made on the eve of Tuesday’s vote, you have to look back about eight years to see why he won this week. 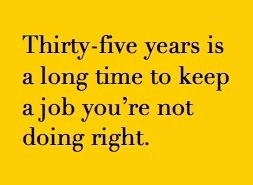 Thirty-five years is a long time to keep a job you’re not doing the right way. LOSING WAS bad enough for McDaniel and the Mississippi Tea Party. 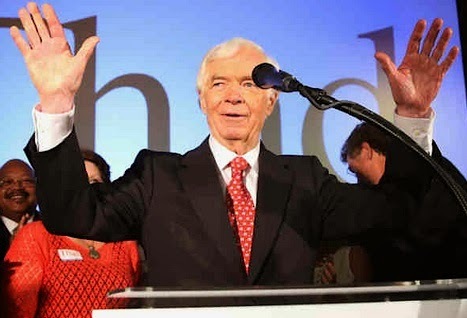 What’s made it worse — the sting that’s been resonating throughout conservative ranks in general — is the fact that Cochran’s margin of victory in Tuesday’s open primary was probably made possible by Democratic voters. Black Democratic voters. They’re still working out the numbers, but it’s apparent that African American voters supported Cochran over McDaniel. 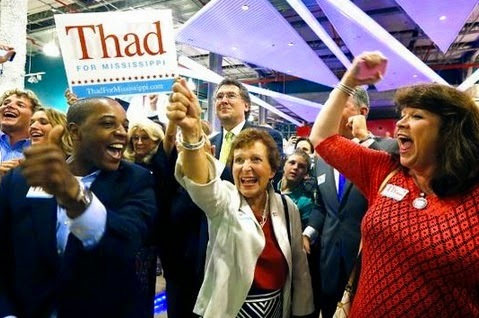 In the process, Cochran and those voters have rewritten the longstanding equation that defines the racial politics of Mississippi — and other states too. The enemy of my enemy is my friend indeed. PARTLY THROUGH its own intention and partly because of market forces (read: the evolution of modern society), the National Football League has been in a maturation process lately, moving in something between a lurch and a confident stroll toward a future it can only partly predict, and can’t prevent at all. 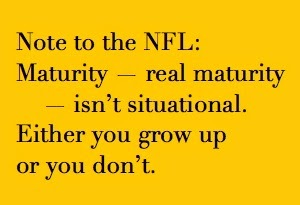 If only the NFL could make up its mind to move consistently in one direction. On June 12, the St. Louis Rams announced that the team had signed all 11 players it picked in the 2014 draft; that includes Michael Sam, the former Missouri defensive standout and the first openly gay player to be drafted in pro football history. Sam, the 2013 SEC Co-Defensive Player of the Year, has since signed with the Rams for an estimated four-year, $2.65 million deal. Sam tweeted that he was “Grateful, humbled and motivated” after officially signing with the team. We’ll see how well he does where it counts; the real crucible, Rams training camp, begins on July 25. But the NFL’s already had a role in helping make history nationally and at the state level. The Rams' choice of Michael Sam may have a big legal impact on the lives of gay couples and employees across the state of Missouri, thanks to a measure in the state’s legislature. THE NFL took another walk into modern times recently; it’s not as important as the league’s official position on Michael Sam, but it’s welcome if you’ve ever tried grappling with Roman numerals. On June 4, the NFL announced that, effective in 2016, it would abandon use of the Roman numerals for titling of the Super Bowl. The league’s practice of using Roman numerals for every championship game since 1971 has always reflected a pompous, self-important sense of the gladiatorial, as if running backs were centurions and head coaches were emperors. 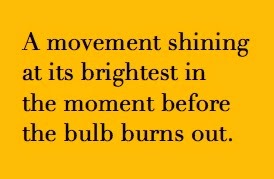 Simply put, it was getting old. The official title of the Super Bowl earlier this year got its fair share of derision, with people calling it “Super Bowl X-L-V-I-I-I,” pronouncing the letters and skipping the Roman enumeration for the number 48 altogether. The NFL’s change for Super Bowl 50, in MMXVI — sorry, 2016 — will short-circuit that embarrassment. But apparently, bewilderingly, just for a while: Jack Jorgensen at SI.com reports that the league will go back to Roman numerals again in 2017 (double-M, X-V-I-I). Which begs the question of why they’re making the change in the first place. Some old habits don’t die hard; they just don’t die at all. Among these is the NFL’s dogged resistance to join the rest of us in the 21st century in coming to terms with the ugliness of a term for Native Americans that the league, and one of its legacy teams, has attempted to legitimize with innocence. "The team name is the team name as it has been for 80-plus years," he said on ESPN’s “Outside the Lines.” "And what we need to do is get beyond sort of understanding this as a point-blank situation and understand it more as a variety of perspectives that all need to be addressed, that all need to be given some weight, so that at the end of it we can come to some understanding that is appropriate and reflects the opinions of all." THE UNITED STATES Patent Office begs to differ. On Wednesday, the government agency’s Trademark Trial and Appeal Board ruled, 2-1, that the Washington Redskins name is "disparaging of Native Americans" and that six of the team's Redskins trademarks must be canceled. 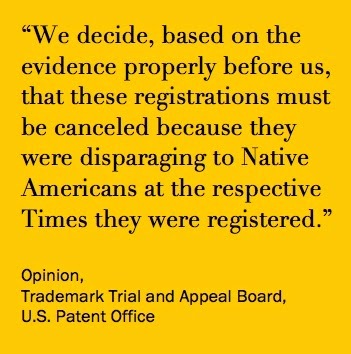 “We decide, based on the evidence properly before us, that these registrations must be canceled because they were disparaging to Native Americans at the respective times they were registered,” the TTBA opinion says. The team won’t immediately lose its trademark protection and can keep it pending an appeal. But the team will lose much of the protection that a federal trademark confers: it now becomes harder for the team to pursue legal claims against anyone who wants to print the name on sweatshirts or other apparel. It’s the off-season right now, but just like all the teams that comprise the NFL, the league has some work to do before the 2014 season gets underway. More than anything else, the NFL has to come to grips with the fact that maturity — real maturity — isn’t a situational experience. Either you grow up or you don’t. It’s the height of hypocrisy to make serious social strides, recognizing that the world doesn’t begin and end on the football field, when the league acknowledges the value of inclusion of gay athletes at the same time it embraces derogatory labels that contradict everything its position on gay athletes represents. The Michael Sam statement and the Redskins controversy show that the National Football League and its commissioner, Roger S. Goodell, have been trying to have it both ways. That’s not going to work for much longer. A groundswell of popular opinion is sending a message a football-savvy commissioner and the league he represents should understand by now: You can’t make a forward pass and a lateral at the same time. Image credits: NFL logo, NFL Super Bowl 50 logo: © and ® 2014 National Football League. 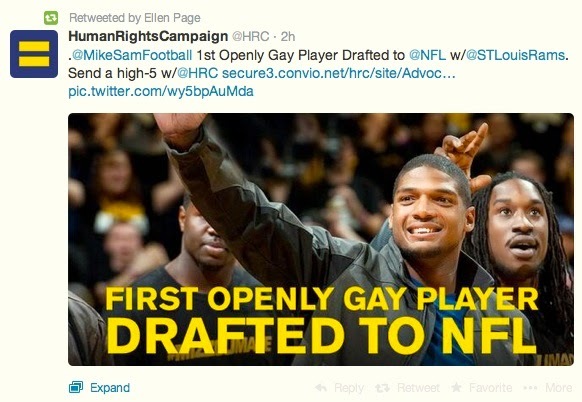 Michael Sam tweet by its originator. THE GORDIAN knot of America’s misadventure in Iraq has re-knotted itself in a way that renounces the received wisdom about the United States’ relationship with its Sworn Nemesis, the Republic of Iran. A quick Google hunt of the phrase “enemy of my enemy is my friend” brings up a full few pages of links to recent stories, new work borrowing the phrase for use in a context whose sudden, tragic irony is inescapable. You don’t even have to read the stories to know: the tables have turned on our relative certainties of who our friends are — or, if not friends, at least those adversaries whose interests improbably dovetail with our own. 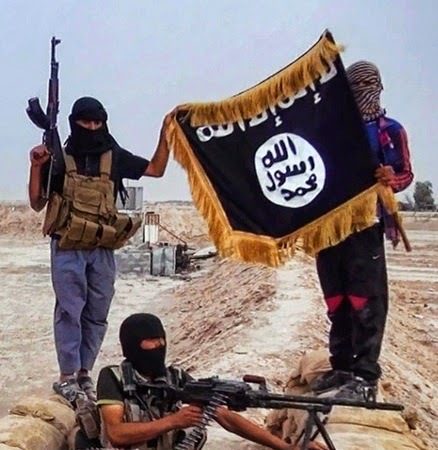 The pending U.S. association with Iran was brought to you by the black-clad, masked Sunni operatives of the Islamic State of Iraq and Syria, or ISIS (alternately, the Islamic State of Iraq and the Levant, or ISIL), who in the past months (and especially weeks) have swept from Syria into Iraq, crashing around the desert, slaughtering scores of captured Iraqi soldiers, intimidating the local populations, siphoning petrodollars from captured refineries, and looting banks of currency and gold bullion to the tune of more than a billion dollars. Flush with cash, weapons, fundamentalist fervor and some of the American technology left in the hands of the Iraqi soldiers who abandoned their posts (and their uniforms), ISIS forces are continuing a lightning-fast drive toward Baghdad, with the apparent intent of toppling Iraqi President Nouri al-Maliki, whose Shia government has pledged to “liberate every inch” of land captured by the Sunni invaders. 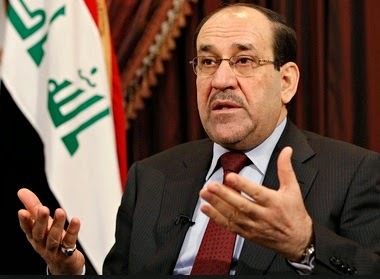 Maliki — who has cut Sunnis out of the Iraqi political process at every turn over eight years in office — is reaping the whirlwind, aggressively pursuing a strategy that, left unchecked or unchanged, will almost certainly ensure his transformation from the president of the Republic of Iraq to, in practical terms, not much more than the mayor of Baghdad. Hertling said Iraq without al-Maliki might be an improvement. And in that collapse, in that vacuum, the same neocon voices and positions that pulled the United States into war in 2003 are rising again. They’re baaaack and singing the same old tune, but singing it in a mediasphere that’s more crowded (and by definition more open to rhetoric than to fact) than it ever was before. 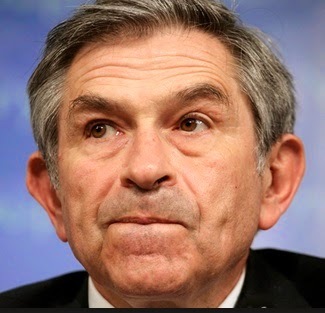 In the last two weeks, former deputy defense secretary Paul Wolfowitz, former Iraqi ambassador J. Paul Bremer III, former U.S. ambassador to the United Nations John Bolton, Weekly Standard editor Bill Kristol and other jurassics from the heyday of the Bush #43 neocon era have gone on a panoramic media offensive, taking to The Wall Street Journal, Fox News, CNN, NBC and ABC to defend the positions that ushered us into war in the first place. Douglas Feith, former Bush undersecretary of defense for policy, cleared his throat in Politico, taking the Obama White House to task for its Iraq policies. Astonishingly, Feith’s central role in the first Iraq war — as a leading architect of the WMD rationale used to legitimize it — wasn’t even mentioned by Politico’s Edward-Isaac Dovere, who quoted Feith several times in a June 12 story. Once you set aside the reflex musculature of such automatic hawks (and others like Arizona Sen. John McCain, who has for months advocated for a heavier boots-on-soil American military posture in the region), there didn’t seem to be many effective immediate options, besides the ritual consideration of drone strikes — something almost certain to be ineffective with no people on the ground. Obama also is considering sending as many as 100 to Iraq to advise its armed forces as it battles the insurgents, according to a senior U.S. official, as reported by McClatchy. YOU’RE NOW invited to experience that sinking feeling, that pit-of-the-stomach déjà vu that accompanies doing something a second time when it shouldn’t have been done the first time. You’re asked to recall that some of the Iraqi towns taken and now held by ISIS forces have names already burned into the American consciousness, for all the wrong reasons: Tikrit, Mosul, Baqubah, Ramadi ... Fallujah. And you’re inclined not to want to do any of that again. We have the president’s assurance that that won’t happen. “We’re not going to allow ourselves to be dragged back into a situation in which, while we’re there, we’re keeping a lid on things, and after enormous sacrifices by us, as soon as we’re not there, suddenly people end up acting in ways that are not conducive to the long-term stability and prosperity of the country,” he said last week. 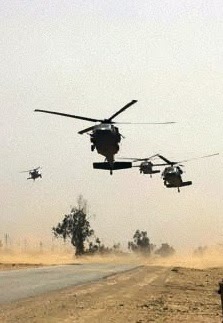 But Iran is the wild card, the possible change agent in the fast-emerging new political calculus of the region. And how the United States engages Iran — diplomatically, politically and, last resort, militarily — over Iraq in the next few months could be the needed reset button for old relationships with old adversaries ... the kind of organically happening event that’s eluded us over years of planned diplomacy and saber-rattling. Analysts in the punditburo have advised against the U.S. taking sides in the new conflict, but that’s never been an option. The United States invaded Iraq in March 2003, mothballed the Iraqi army, decapitated the Iraqi government and began the process of de-Baathification that, with the election of al-Maliki, indicated that we were taking a side in the sectarian strife that has shaped and roiled that country and the region for 1,300 years. Now, the instability that ISIS personifies has reinforced the established U.S. position of support for Maliki, a Shiite who’s getting an assist from ... the Shia government of Iran, and the government of Syria, ruled by Bashar al-Assad and other leaders of the Alawite sect, a more secular Shiite offshoot. The blitzkrieg rise of ISIS also compels the United States to realize that Iran, which has no more desire to watch ISIS destabilize the region than the U.S. does, is now a reluctant bedfellow, an anathema transformed, for the time being, into something closer to a necessary inamorata. WELL WE DIDN’T see this coming, now did we? In a 24/7 media environment pretty much inured to everything happening sooner or later, the overnight demolition of the political career of House Majority Leader Eric Cantor has the mediasphere scrambling for adjectives and precedent. There’s plenty of the first to go around; we scribes of the interwebs do what we can to make sure of that. But precedent? There is none. Cantor, who on Tuesday lost his primary congressional race in the Virginia 7th District to a game Tea Party challenger, was the first House Majority Leader to ever lose a primary. 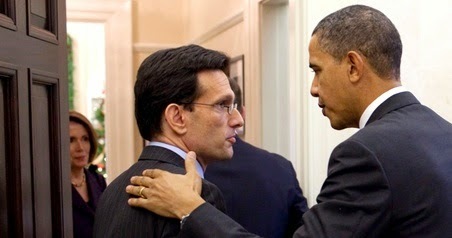 Serving that district since 2001, Cantor was long thought to be heir apparent to the post of Speaker of the House. He lost his primary bid to David Brat, an economics professor at Randolph-Mason University and Tea Party evangelist of the moment. The 11-point margin (Brat 55, Cantor 44) can only be characterized as a blowout, and a stunning one for Cantor, whose own internal polling put him well ahead as recently as last week. Some in the rightward chambers of the punditburo have pointed to Cantor’s thrashing in Virginia and the June 24th runoff between incumbent Mississippi Sen. Thad Cochran and his Tea Party challenger, Chris McDaniel, as a renascence of the Tea Party. It is, but in only the narrowest of terms. The Tea Party movement’s biggest problem since its astroturfed inception in 2009 has been a problem of exportability — of transforming primary-season victories into general-election victories, and that hasn’t changed. Reaching the demographically broader, more diverse general population of many states, and certainly the nation as a whole, is the challenge the increasingly right-moving TP crowd has no answer for. That’s why, despite regional victories in the early going of this campaign year, the Tea Party may well be — like one of the old incandescent bulbs we’ve been replacing — shining at its brightest in the moment before the bulb burns out. 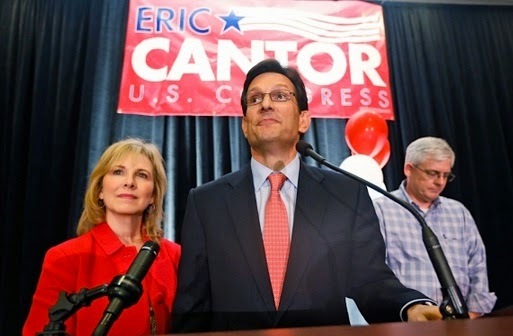 Cantor stepped to the microphones on Tuesday night, game but gut-shot in his concession speech to his supporters. “Obviously, we came up short,” he said, in a mastery of understatement. CANTOR’S DEFEAT wasn’t a matter of being outspent. Just the opposite: The outgoing House leader (he formally resigns on July 31) spent about $5 million on his primary fight, compared to the couch-cushion-money war chest of $206,000 spent by Brat’s insurgent campaign — a triumph of economic efficiency you might expect from an economist. 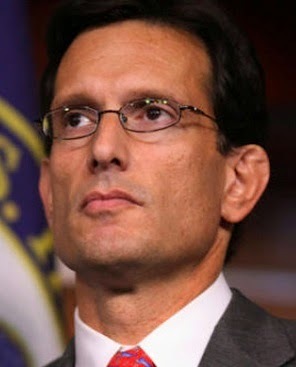 As stalwart a Republican as you’d find on Capitol Hill, Cantor had his comeuppance in the Virginia 7 in different ways. 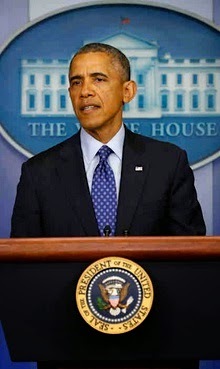 He was taken to task by voters on the matter of immigration reform. Cantor stood accused of rank apostasy, and being in league with President Obama on seeking a palatable program for immigration reform via his proposal of the KIDS Act, his GOP version of the DREAM Act. But that was only part of Cantor’s problem. Another issue for Cantor, thoroughly explained in Christopher Bedford’s story in The Daily Caller, had to do with detachment from the people in his district, and the perception that Cantor was working both sides of the street, being politically disingenuous with the people who mattered most: his constituents. 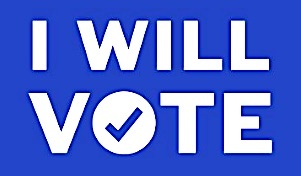 “While other leadership candidates, including Senate Minority Leader Mitch McConnell, spent months courting tea party and base voters, Cantor’s team turned on them in a sustained and unsuccessful campaign that culminated in his Tuesday night defeat,” Bedford wrote Wednesday. In November 2013, Virginia Attorney General Ken Cuccinelli, Lt. Gov. E.W. Jackson and their candidate for attorney general, Mark Obenshain, were defeated by Democrats in their respective bids for governor and attorney general. 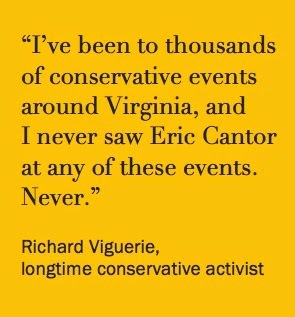 It was then that Cantor and his allies mounted a bid to retrieve Virginia politics from the rise of Tea Party activists, beginning the alienation that led to what happened on Tuesday night. THE QUIETLY protracted geopolitical choreography that resulted in the May 31 release of Bowe Robert Bergdahl from almost five years of captivity, by Haqqani allies of the Taliban, was first spun by the White House as an unalloyed triumph of American determination in the face of a shadowy, intractable enemy. What a difference a week makes. In that time, we’ve seen the Obama White House tweak its rationale for negotiating the release of the only American captured on the Afghan war, in exchange for five Taliban former operatives held at Guantanamo. We’ve witnessed Bergdahl move in the public eye from hero survivor to probable deserter to possible traitor to likely basket case. And we’ve seen an implicit (and up to now unthinkable) questioning of the idea that Americans don’t leave their soldiers to the mercies of the enemy. At this point — with the Army investigating Bergdahl’s actions on June 30, 2009, when he went missing; with Bergdahl homecoming celebrations on hold in his Idaho home town; and with Bergdahl himself not saying much on his own behalf (so far) — the matter’s generated almost as many questions as answers. Question #1: What the hell really happened? Question #2: What the hell happens now? 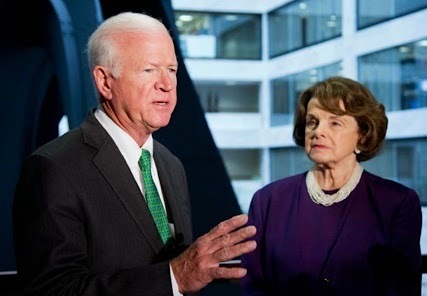 California Democratic Sen. Dianne Feinstein and Republican Sen. Saxby Chambliss tag-teamed the White House on Tuesday, calling Obama to task for not giving Congress the required 30 days notice of a Gitmo release, and rejecting the administration’s claims of the need for urgency in extracting Bergdahl. 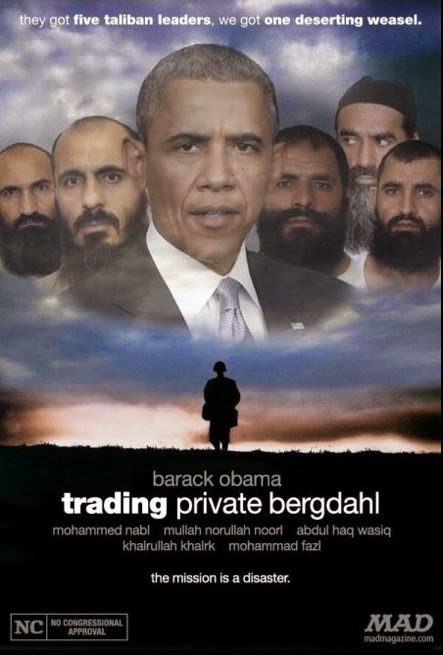 The Associated Press reported that, in fact, the administration held two briefings for House Speaker John Boehner and key Republicans in November 2011, and January 2012, in which the possibility was raised of exchanging Bergdahl for the five Taliban. WHITE HOUSE concerns about Bergdahl’s health could have been real and justified. Until he was seen in the actual U.S.-Taliban exchange, there’d been precious few if any recent photos or video of Bergdahl. He was reportedly last identified in a video from December. With no more recent visual evidence of his status — proof of health, if you will — there may have been no compelling evidence one way or the other as to how healthy he really was by the end of May. 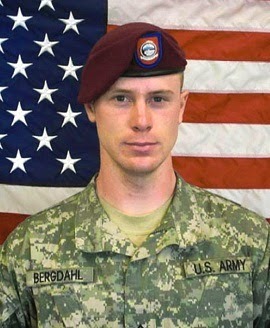 That’s something only an actual sighting of Bergdahl could have validated, if not confirmed. Feinstein reportedly had access to information on Bergdahl’s health, enough to have determined that Bergdahl’s health issues were overblown. How did she get this information? What was her source? American doctors? Afghan doctors? And without knowing that source of that intel, even in general terms, is there any reason to fully accept the idea that it was accurate? Feinstein’s dispositive assessment may not be as airtight as she’s led to believe. The Bergdahl matter has led to strange — and even unsettling — challenges to a longstanding ethos vis-à-vis the treatment of our military. Certain accepted truths about how we treat our soldiers are now under fire. The rush to the tumbrels, the scream for Bergdahl’s head in a basket at the foot of the guillotine has overlooked the standing principle that the United States doesn’t abandon its servicemen and women. That principle — basic to our national military lore, our civilian expectations and every good war movie you’ve ever seen — is smartly defined in six words: We Don’t Leave a Soldier Behind. 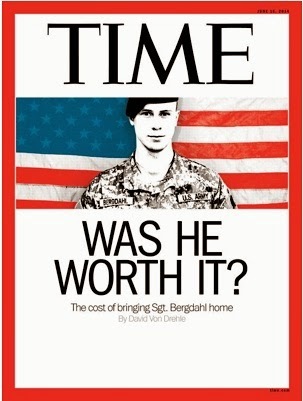 Others haven’t been so charitable in their assessment of Bergdahl’s value. On June 2, Joshua Korder, a former Army sergeant, told CNN that Bergdahl was “at best a deserter and at worse a traitor.” Evan Buetow, a sergeant in Bergdahl’s 2nd Platoon, Blackfoot Company, 1st Battalion, told The AP that Bergdahl should face trial for desertion. 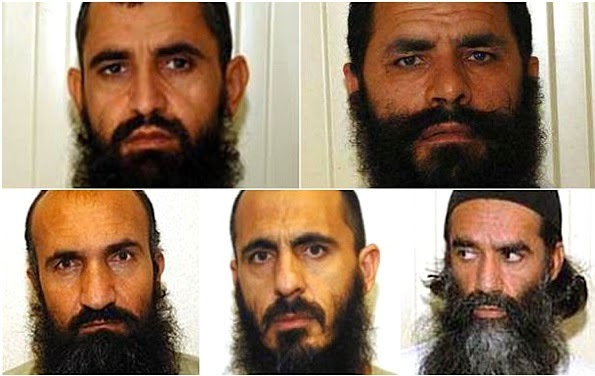 THERE’S ALSO been gnashing of teeth about the release of Mullah Mohammad Fazl, Mullah Norullah Noori, Khirullah Said Khairkhwa, Abdul Haq Wasi and Mohammad Nabi Omari, the five Taliban dead-enders now sequestered in Qatar for a year of house arrest. Fears are rampant everywhere that they will eventually return to the arms of the Taliban, to renew their subjugation of Afghanistan. But John Bellinger, Adjunct Senior Fellow in International and National Security Law at the Council on Foreign Relations, recognizes that, in an asymmetrical conflict like the one we’ve been fighting in Afghanistan, there are no pristine options. “It is arguably better for the President to get something — the return of an ailing U.S. soldier held in captivity — rather than nothing in return. And it is arguably better to have sent them to Qatar to be held for another year than to have returned them to the Karzai Government, which might have released them immediately.